Fawakay Villas is a lush complex of five sand-coloured houses and three eco villa suites, built in an unobtrusively modern style and surrounded by a verdant three and a half acres of garden. The entire hotel sleeps up to 30. 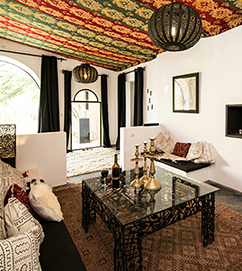 Whether you want a quiet getaway, a family holiday to remember, a private use celebration or simply want to have a little luxury while exploring nearby Marrakech or the Atlas Mountains, then Fawakay Villas is an ideal choice! 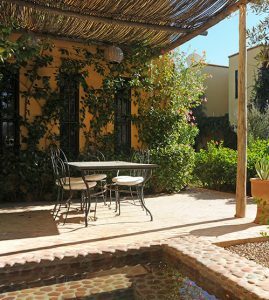 An elegant two-storey villa set in its own private garden with plunge pool, dining area and magical Berber tent. 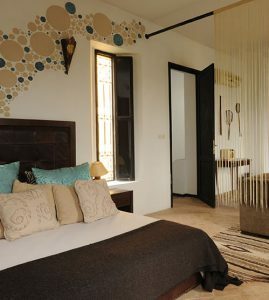 A beautifully-designed three-bedroomed villa boasting a master suite upstairs. Surrounded by roses, jasmine and bougainvillea. The most secluded of the three villas, Taos comprises four spacious bedrooms as well as plunge pool, dining area and private gardens. The Garden Suite is a stylish and secluded single-story villa with its own garden, a sitting room and a double and a twin bedroom. 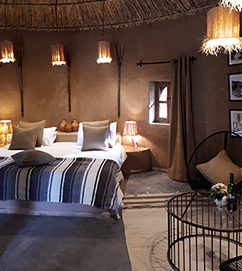 Each of our three innovative, circular, straw-roofed eco villa suites sleep 2 people. The eco villas are set in their own area of the garden and each has its own outdoor seating area. All prices include breakfast. Please note that the prices below are for the entire year regardless of season. Minimum two night stay. A non-returnable deposit of 30% is required at the time of booking to secure your room or villa for you. The balance must be paid one month prior to arrival. Exclusive use of all villas: £1800 per night with breakfast. Minimum three night stay. All prices on B&B basis. Half board available at a supplement – please enquire. Extra beds, £30 per night. Under 5s free. Highchairs, cots, baby listening devices are available free of charge. 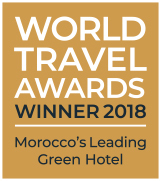 Airport transfers from Marrakech can easily be arranged. Tourist tax of 25 MAD will be added per person per day. Not applicable for children under the age of 12.